Chen Qingzhou is a 19th-generation lineage holder in Chen Family Taijiquan Gongfu and a direct descendant of the ancestral founder of Chen Village where Taijiquan originated. Born in 1934, he began training in Chen Family Old Frame under his father, Chen Wufang. He was later sent to study with the great 18th-generation master, Chen Zhaopi, disciple of Chen Fake. From his early youth, Chen Qingzhou had a tremendous love for Taijiquan. He practiced diligently and took careful notes of everything he learned. As a result, Chen Zhaopi permitted him to teach after only one year of study and granted him the status of rumen (indoor) disciple in 1962. In 1974, Chen Qingzhou began learning Chen Family New Frame from Chen Zhaokui, the youngest son of Chen Fake. He subsequently abandoned New Frame, asserting that Chen Family Taijiquan should be preserved and taught as it had been for hundreds of years. He therefore retained the entire Old Frame system: Old Frame First Form, Old Frame Second Form (Paochui), Taiji Single Sword, Taiji Double Sword, Taiji Single Broadsword, Spring-Autumn Broadsword, Short Staff (Wu Hu Qun Yang Gun), Three-Man Staff, Pear Blossom Spear/White Ape Staff (Li Hua Qiang Jia Bai Yuan Gun), Taiji sphere, Taiji ruler (xing gong bang), pole shaking (dou gun zi), the five push-hands techniques of Chen Village, and joint locking and grappling (na fa). The empty-hand forms contain the core principles of Chen Family Taijiquan: chan si jin (silk-reeling energy), yin jing lou kong (leading into emptiness), zhou hua (neutralization), na fa, the basic energies, etc. In addition to these skills, weapons are used specifically for building up fa jin (explosive force), ting jin (sensitivity), and improving footwork. Chen Qingzhou spent twenty years training and teaching (and sometimes sleeping) in the Liberation Cemetery in Wenxian. He had taught all over the world since the early 90s. It is often said among Taijiquan practitioners that two of the highest skills in the art are Chen Xiaowang's fa jin and Chen Qingzhou's zhou hua (neutralization). Shortly after China liberalized its relations with the West, Chen Family Taijiquan research and training centers were established in both Wen County and Chen Village. Chen Qingzhou was named General Instructor and Head Coach of the Wenxian Center, as well as Vice-Secretary General of the Wenxian International Annual Conference of Taijiquan. He had accepted the position of Head Coach at the Army Technology University of Nanjing, and had also accepted teaching appointments in ten provinces. For over four decades, he had taught Chen Family Taijiquan before he passed away, exactly as it was handed down to him by Chen Zhaopei. Many of his more than 10,000 students have attained high skills and recognition. His eldest son, Chen Youze, is a China National grade coach. He won the gold medal three years consecutively at the China National Confrontational Push Hands Competition, and six times in Henan Province. Chen Qingzhou's third son, Chen Youqin, is one of China's most highly acclaimed Taiji masters (Mingjia). He started teaching in 1984, and since then, 300 of his students who competed in state, national and international competitions have received gold, silver or bronze medals or placed fourth. Chen Youqin is recognized throughout China as a leading promoter of Chen Family Taijiquan. Chen Qingzhou's fourth son, Chen Youhua, won first place for four consecutive years in the Henan Province Push Hands Championships. His youngest son, Chen Youqiang, won first place for three consecutive years. At the Old Masters Competition in Henan Province, Chen Qingzhou himself won three first places and an outstanding performance prize in the forms, single-sword, and self-elected forms divisions. He received outstanding performance awards in the past two Wenxian International Meetings of Taijiquan. Chen Qingzhou had published numerous teaching materials on Chen Family Taijiquan. 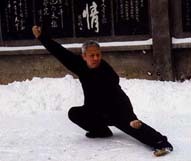 His instructional videotape, ``Chen Family Taijiquan, Gongfu Frame,'' was filmed at the Yellow River, Shaolin Temple, Nanjing, Xulu Village, Chen Village, and the Longmen Buddhist Caves in Luoyang. Chen Qingzhou believed that Traditional Chen Family Taijiquan is a treasure that should belong to the world. This belief led him to the U.S. many times to share his knowledge with interested practitioners of the art. 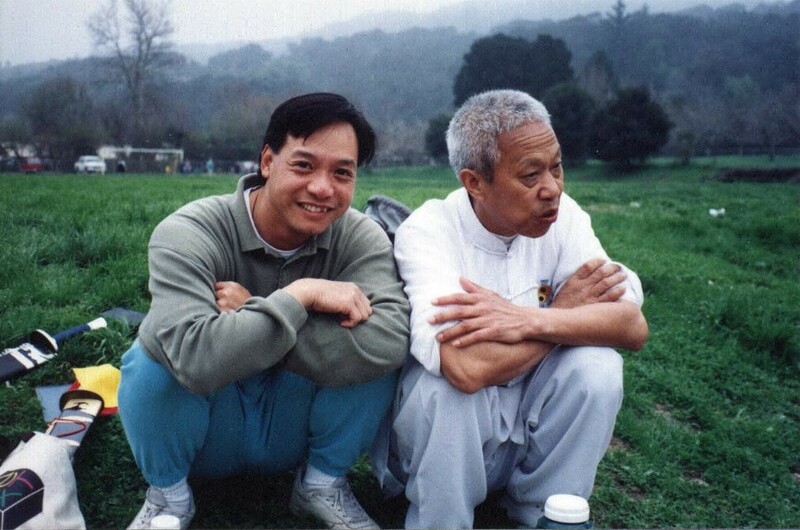 Several of his rumen disciples teaches in the San Francisco Bay Area to help spread the Lao Jia Chen Taijiquan. There are also other indoor disciples teaching in Monterey area, outside the Bay Area as well in Ohio and Washington States, outside the State of California. He left a great legacy for us to follow and pass on to our children, grandchildren, and generations to come. The empty-hand forms contain the core principles of Chen Family Taijiquan: chan si jin (silk-reeling energy), yin jing lou kong (leading into emptiness), zou hua (neutralization), na fa, the basic energies (peng, lu, ji, an, cai, lie, zhou, kao), zhan, you, lian, sui, etc. In addition to these skills, weapons are used specifically for building up fa jin (explosive force), ting jin (sensitivity), and improving footwork. Shortly after China liberalized its relations with the West, Chen Family Taijiquan research and training centers were established in both Wen County and Chen Village. was named General Instructor and Head Coach of the Wenxian Center as well as Vice-Secretary General of the Wenxian International Annual Conference of Taijiquan. taught Chen Family Taijiquan for 39 years, exactly as it was handed down to him by Chen Zhaopi. Many of his more than 10,000 students have attained high skills and recognition. accepted the position of Head Coach of the Army Technology University of Nanjing. accepted teaching appointments in ten provinces in China. won three first places and outstanding performance prizes in forms, single-sword, and self-elected forms divisions at the Old Masters Competition in Henan Province. received outstanding performance awards in two consecutive Wenxian International Meetings of Taijiquan. was recognized in 1994 as one of the twelve outstanding taiji players in the world. His eldest son, Chen Youze, is a China National Grade Coach. He won the gold medal three years consecutively at the China National Confrontational Push Hands Competition, and six times in Henan Province. Chen Qingzhou's third son, Chen Youqin, is one of China's most highly acclaimed Taiji Masters (Mingjia). He started teaching in 1984. Since then, 300 of his students who competed in state, national, and international competitions have received gold, silver or bronze medals or were placed fourth. Chen Youqin is recognized throughout China as a leading promoter of Chen Family Taijiquan. Chen Qingzhou's fourth son, Chen Youhua, won first place for four consecutive years in the Henan Province Push Hands Championships. His youngest son, Chen Youqiang, won first place for three consecutive years in the Henan Province Push Hands Championships. Chen Qingzhou believes that traditional Chen Family Taijiquan is a treasure of China and should belong to the world. This belief has led him to publish numerous teaching materials on Chen Family Taijiquan. He also made an instructional videotape, Chen Family Taijiquan, Gongfu Frame, filmed at the Yelow River, Shaolin Temple, Nanjing, Xulu Village, Chen Village, and the Longmen Buddhist Caves in Luoyang. He has been in the United States several times to share his knowledge with interested practitioners of the art. 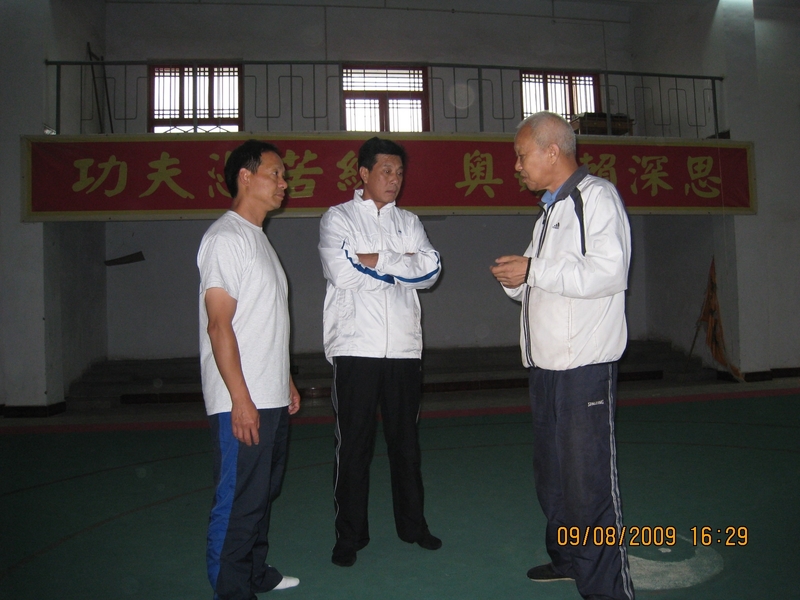 Tony pracitced push hands at Master Chen Qingzhou's school before his 2000 competition in Chen Villgage. Master Youze was there going over the push hands competition rules. Master Youze and Tony listening to Grandmaster Chen Qingzhou's lecture at his school. Receiving Qin Na from Sifu.